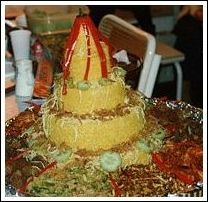 Yellow Rice Recipe or Nasi Kuning is very popular Indonesian recipe for party as nasi tumpeng. Because it looks very beautiful with side dishes around the yellow rice. It has an invited looks. And you know, this is also very easy to make. You can decorate nasi kuning with many different side dishes like Hot chicken with a lot of chilies, Urap or Indonesian Vegetable salad, Grilled Chicken Roll, Sambal Goreng Tempe Kering, chicken sate, cucumber, and sliced red chilies, so you will get the lovely looks of nasi tumpeng like the picture above. Steam the rice for about 25 minutes until it is half cooked. Set aside. Add the turmeric powder, Bay leaves, Kaffir lime leaves, lemon grass stalk, galangal into the santan. Add some salt and let the santan boiled while you stir it occasionally. Remove from the heat. Pour the rice into the santan. Stirring it until the santan has been absorbed by the rice. Add the lime juice. Steam the rice until done, about 60 minutes. To get a good yellow color, wash and drained the rice the day before and add turmeric powder and pour water until the rice covered. Let it for the whole night and by morning you have already yellow color rice. If you do this don’t add too much turmeric powder into the santan. A little bit would be enough.